It's been a year and a half since Oakland's Bay Wolf called it quits after 40 years on Piedmont Avenue, marking an end of an era for a beloved and influential East Bay fine dining institution. Owner Michael Wild, we soon learned, had a succession plan in mind, and it was to sell to a restaurateur couple he'd known for a number of years, Rich and Rebekah Wood, the owners of Wood Tavern and Southie in Rockridge. Now after a six-month renovation that included the opening up and modernization of the kitchen, the place is ready to reopen within weeks as The Wolf, as the Chronicle reports, paying homage to Wild's legacy while hoping to introduce a new generation of diners to this cozy and welcoming space. A new, L-shaped bar has been added to the front of the house  which was, once upon a time, a Craftsman-style home with a front porch that is also now used for dining. "People are going to be pretty surprised,” says Rich Wood of the remodel, which he also describes as "Bay Wolf on steroids." The chef at The Wolf will be Yang Peng, who is also a partner in the new restaurant. Peng has been executive chef at Wood Tavern for several years, and she'll be replaced there by Esteban Escobar, formerly of SF's Town Hall. She tells the Chronicle she's planning to feature "updated, California-seasonal take on French classics like coq au vin, veal, escargot and, of course, duck, a signature dish at Bay Wolf." 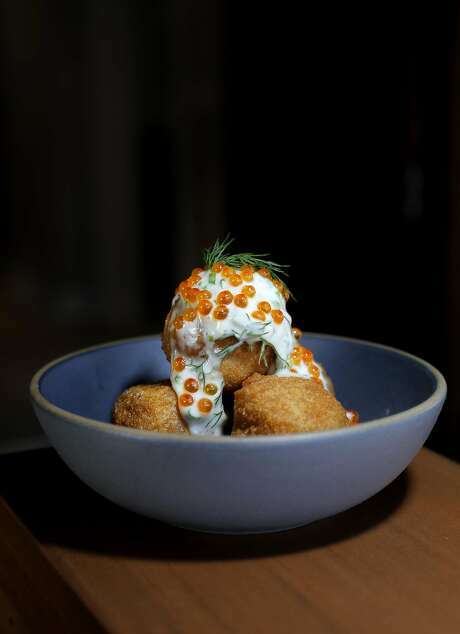 There are also some delicious looking pommes dauphine (fried potato puffs) topped with remoulade and trout roe, and Peng says she plans to do baguette sandwiches at lunch. Also, longtime regulars will recognize general manager David Johnson, who'll be returning to his post, and the Woods have told Wild he's welcome to come back and work the front of the house whenever he likes, in his retirement. I'll update you when the opening date is finalized, and reservations become available.